Driving east, then north, across this land. The closer we get to the Adriatic the more troubled we get by what we see. We pass some horrendous industrial parks and concrete-filled cities of ugly apartment buildings. These fill us with dread. What sort of place have we chosen through internet for our vacation? After 4 hours of driving we arrive at Villa Fiore in Terrano Nuovo. A handsome large structure situated on a side of a hill, surrounded by fields of sunflowers and other crops. Our room is cool, lovely, spacious, and high. The bathroom is immaculate. Gracia, our hostess, speaks passable English and greets us with chilled glasses of the fruity local white wine and a big smile. The swimming pool, though small, is inviting. When I step out of my sandals onto the cool stones of the patio, stairs and the floor of our room I am transported into a different reality. We are immensely relieved. In the morning we do nothing in particular. Read, triangulate the place, take in the views. In the afternoon we venture out into the country. Terrano Nuovo is a charming village. People greet us, talk to us, inform about the upcoming concert of operatic music, featuring the repertoire of Benjamino Gili. At 2 PM everything closes down, just as we become hungry. After some inquiries and a bit of driving we find a restaurant outside the village. No tourists anywhere. Not even Italian tourists. We take the meal over a panoramic view of the valley. It is slow and satisfying. All we can do afterwards is spend some time in our room. Siesta makes imminent sense. Philip is beginning to find his way around the maze of country roads in this area. The directional signs, initially incomprehensible, are beginning to make sense. This is impressive because the maps are incomplete and at times inaccurate. The landscape is our main preoccupation today. If the word ‘quilt’ had not been invented yet, this place would give rise to it. The gentle rolling hills on multiple parallel planes remind me of a primitive theater stage set. The mountains on the horizon are massive, Alpine in shape. A beach day at Alba Adriatica. Row after row of umbrellas and chaise lounges. Crowded with arrangements but not with people. The sense of clutter brings to mind contrasting openness of Wellfleet. Nobody asks us to pay, either for parking, or for the use of beach furniture, or for public toilets. Women wear two piece bathing suits almost exclusively, and without regard for the shape or size of their flesh. I am glad to own one as well. For the first time since I have acquired it in Portugal I feel comfortable wearing it. We take lunch on the terrace of the beach restaurant. It appears that every meal costs almost the same amount, regardless of what we order and where we take it. And it is not that much, about 20-22 Euros. This will continue in the days which follow. Of course, our orders do not vary much: antipasti of prosciutto, bread, cheese and melon, a pasta dish of some kind, white wine, green salad, coffee. Plentiful and satisfying. The day drags a little in the afternoon. We are not accustomed to this slow tempo of life. 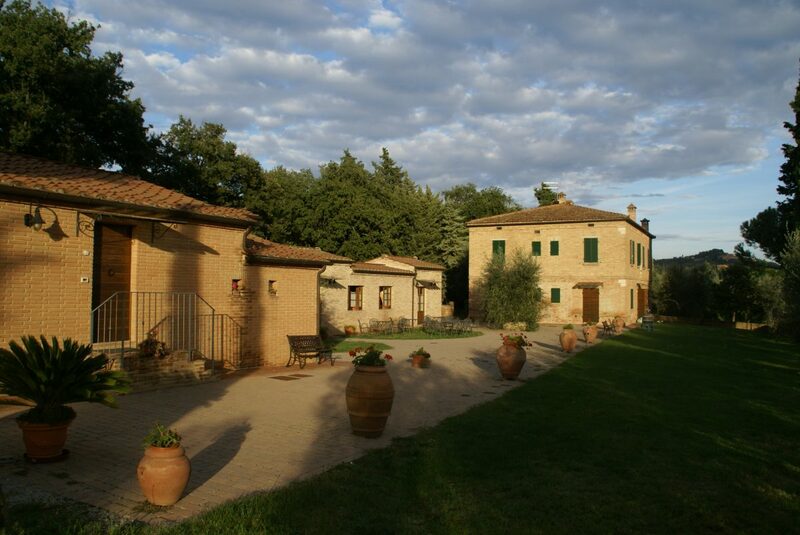 We swim in the pool of Villa Fiore, read, drive around through neighboring villages, glide into the evening meal, watch other guests, immerse ourselves in the early evening light. The walk on the local roads after sunset teaches us that Italians in the region keep dogs and that the dogs are not leashed or fenced. Of the four possible roads we try only one turns out to be safe from canine attacks in the dark. We get up ready for a major outing. It starts with Civitella del Tranto. This is an exquisite small town chiseled into a mountainside. During the next week we shall find many such dwellings perched on sides of mountains and hills and rendering breathtaking views. But Civitella will stand out for its beauty. An imposing fortress dominates the town. We walk to its entry but do not bother to go in. We each have seen many such fortresses before. It is better to just look down from here on the town below, with its rooftops, streets, and terraces. There are no tourists here except for a couple of organized groups who have arrived by busses to see the fortress. At the same time, I do not get the sense that this place is ‘local’, ‘authentic.’ It is its neatness that strikes me. Not a single item out of place, not an inch of peeling paint. Many houses look recently renovated; several are under construction and promise to be luxurious while quaint. Philip thinks that this town must be on the UNESCO list of world heritage and benefits from its funds while conforming to certain looks. I see here new money, perhaps a place for a vacation or a retirement home of well-to-do Italians. No matter. Civitella is beautiful. A winding mountain road brings us to Pietracamella (elev. 1005 m.). Breathtaking views along the winding mountain road. Thick woods. Very green. Like Civitella, Pietracamella sits on the edge of the mountain. But this is a very steep mountain, and the town is really high up there. This is the starting point for hikers and skiers who head for the resort right below it. Improbably, we find a tiny restaurant for lunch. Only one of the six tables is occupied. A large television screen in the corner discreetly shows black and white footage of some modern Italian history. This is an immaculate place with golden damask tablecloths and napkins. We order our usual, except that this time I try gnocchi and Philip tries meat ravioli. We skip wine. I wonder how many days I can go on, perfectly satisfied with having pasta twice a day, and not a taste of meat. So far, this is the fourth day of this perfectly satisfying diet. So why can’t there be such a restaurant in rural New England? There is nothing unusual about either the décor or the menu of this place. So simple. All it would take is a cook with a repertoire of 20 dishes or so, fresh ingredients, locally grown tomatoes. And yet, we know it to be impossible. Even if someone would decide to open such an establishment, it would be for the upscale moneyed clientele with taste for expensive imported wines. Waiters would expect 20% tips and get hostile when not satisfied. I have no answer to this question. I save it for my friends in the US, especially Olivia and Rob. A ski lift right outside the town takes us several hundred meters up, beyond the tree line. From there we hike for a couple of hours. The gravel under the feet and the cliffs around us are made of what looks like marble. I have this amusing theory that marble made all the difference in the divergent evolutions of the cultures of Italy and northern New England. Because it is so soft and polishable, marble created a culture of sculptors and connoisseurs of fine art. The art, wine, fruit and sun did the rest. On the other hand, the northern New England is made of granite. It is the material of choice for kitchen counters, not sculptors without industrial equipment. This, and the harsh weather, have not been conducive for contemplation of fine art and long siestas. After a slow morning we get out of Villa Fiore. Our Dutch neighbors – six adults and five kids – took over the pool on this scorching day. They are considerate and low keyed but their sheer number creates a crowd. So, to our peril, we start the day with a long lunch at a roadside restaurant. We both eat too much (I cannot resist finishing up the generous portion of close to perfect gnocchi with mushrooms), and wine is altogether a bad idea. We arrive in the city of Ascoli Picena during the three o’clock heat apex (36 in the shade) tired, sluggish, dispirited. Ascoli is a commercial city situated at the bottom of a deep valley. No mountain breezes reach down here. It becomes unbearable when the sidewalks heat up. So we wait for our energy to return while sipping mineral water at an outdoor café of the main square Piazza di Popolo. This is a Renaissance marvel of beauty, which inevitably brings to mind Piazza di Marco in Venice. Everything here, from paving to buildings to outdoor sculptures, is made of that particular stone we saw yesterday in the mountains. We identify is as Travertine marble (though we are not certain about this diagnosis). The stone is grayish, pinkish white with uneven texture and multitude of veins. The main structure at the square is a magnificent villa which would feel at home in Florence. Colonnades define the perimeters of the piazza. This is the peak of siesta and we see hardly any people around us. We make an effort to sightsee Ascoli but to no avail. Soon, we are in retreat, heading in our air-conditioned car towards the mountains. Mercifully, within half an hour we arrive at Saint Giacomo (elev. 1100 m). This is a ski resort nestled deeply in the forest. The temperature seems at least 10 degrees centigrade lower than in the valley. A short walk thought the woods, and about three hours after the ill-fated meal, restore our energy. But not sufficiently for a really serious hike. We reach our next destination by car. It is a village of Ripe where we hike for about three quarters of an hour to explore Grotto San Angelo. The cave is well equipped for tourists but as usual we are the solitary visitors. No, tickets, no guards, no tourists. This region of Italy belongs to us. We round up the day back at Civitella. Sitting at an outdoor café over some olives, bread, and beer, followed by ice-cream, we marvel at the familiar landscape. Our neighbors at this café are the usual suspects: clusters of elderly men, talking and talking. This has been a long day. Refreshed, we return to Ascoli. In search of a parking place Philip carelessly back up into a car behind us. A loud noise alarms me, with instant images of insurance problems, bureaucracy, etc. It all ends up well though because the woman driver of the other car does not even leave her car to search for damage. Such close encounters between fenders must be daily events here. In the US things would have taken a different course. Two pairs of sandals and a pocketbook later I can admire the beauty of Piazza Popolo and its environs. It feels good to own these intensely feminine and well built Italian sandals. Italians have a genius for designing shoes and bags. Just as yesterday, Piazza Popolo is almost empty, even though this is a market day. We spend the afternoon on the beach at Villa Rosa. Lively place for locals. We hear non-Italian spoken here only occasionally. Next to me two Muslim men have set up a shop. They spread a large sheet on the sand – looks like flooring for a tent – and discharge on it dozens and dozens of women dresses and towels in a colorful display. One of the men lazily watches the inventory while the other walks around with samples. I do not see anybody buying anything’s. It gets cloudy as the day progresses. We anticipate rain. After yesterday’s overeating we are not in a mood for hot lunch. We munch on cookies and plums purchased from a street vendor. Around four or five o’clock we move on. A quick sandwich and a beer, a stop at a supermarket, a drive to Campli. Philip has mastered the web of local roads. Campli meets our expectations based on the guide book. Another hill-top town within ancient city walls, protected by insurmountable cliffs, and filled with the shadows of medieval life. Nothing much has changed in this place during the past several centuries. A perfect renaissance square well preserved villas and a church. A sense of a self-contained community. Our presence here is both noted and ignored. We sit under the colonnade in the main square, eating ice-cream and watching the usual clusters of older men in animated conversations. For dinner we return to our familiar restaurant in Villa Bizzarre. The waiters greet us with smiles of recognition. On this Saturday night the place bursts with people. All the rooms are open for business. There must be 150 people being served simultaneously, mostly extended families. We eat on the terrace while watching the electrical storm over our valley. This is our first truly cool day. We welcome the clouds and the storm. After three intense days of explorations we are recuperating by the pool. Some of the Dutch guests have left, others have arrived. They all look young and prosperous. Considerably more so than we were at their age. They become engaged with each other but not with us. Either our age or our English, or both, set us apart. Our lunch consists of cheese sandwiches and tomatoes eaten hastily in the room. We need a break from the warm midday meals. Later in the afternoon we explore Teramo. The city has some splendid Roman ruins and a couple of XV century churches. Nobody seems to be particularly sentimental about these relics. A modern building literally grows out of the center of a Roman amphitheater. The crumbling patches in the church walls are filled with bricks. This city has its eyes on the future, and tourism is not its destiny. After walking for quite a long time we drive back towards San Giacomo and the mountains. Rain comes and goes. Somehow, we do not like hiking and my cramps feed the lazy spell. By seven thirty we are back at Villa Fiore, ready for the last slow meal on the terrace. I finally satisfy my curiosity about this house and its occupants. The old man we see carrying small chores around the villa is one of two brothers who own this place. The oldest part of the building, which has been in the family for generations, is several hundred years old. The other brother (and wife?) lives on the second floor of that wing. “Our” brother, his wife and two daughters (including Gracia) live in the newer, one hundred year old, wing of the second floor. There is also the newest addition to the second floor, built during the past couple of years. It has two mini apartments, a grand terrace, and a spectacular view. The entire third floor, probably part of the construction of a century ago, has guest rooms. At full capacity Villa Fiore can accommodate 25 guests. I will return here with great pleasure. We get a bottle of fine local red wine for a farewell gift from Gracia. Our destination today is Chieti, but first we stop at Ascoli to deal with a defective sandal. The cloudy weather continues, and it is splendid to be here on a cool morning. We admire, again, the main plaza. There is something marvelous about returning repeatedly to the same place. The familiarity relaxes while the beauty acquires life and new dimensions. The business with the sandals gets settled through a compromise. I never get my refund but find a way to fix the defects. Just as well. I really did not want to part with my new sandals. We spend the next three hours driving through the now familiar landscape. It is difficult to locate our next guesthouse. We finally do, and find ourselves high on a hill overlooking one of those great valleys of Abruzzo. A short visit to Chieti yields a rather formal city with a promise. But not today. After a late lunch we spend the rest of the day reading on the veranda. Dinner with our hosts, family style. A dozen people around the table. A German couple, a pair of youthful migrant workers from Albania and Morocco. And the extended family of our hosts. Except for Anna, our landlady, and the German couple, nobody speaks English. The German woman, Claudia, shares French with Anna’s husband and the Moroccan youth. No other overlaps of languages around this table. We cope as best we can. The meal is good but too much food too late at night. We hit the bottom. Chieti turns out to have no interest to us, shopping is a waste of time here, we are bored and regretful about spending three nights in this area. Our spirits are low. We contemplate canceling everything and driving to Rome for a day, then give up the plan as unrealistic. After walking the city street in a vain search of some important Roman ruins we have early lunch at the same place as yesterday. We cannot wait to get out of this city and head for the mountains. The winding mountain road takes us to about 1000 meters elevation. The views are sweeping. Houses we encounter are large and luxurious. They look like suburban homes of the well-to-do. Close to the top of the mountain we find a ski resort, a lift, and clusters of one family homes. These must be vacation homes for ski lovers. We hike in the handsome woods and gorge ourselves on plentiful ripe raspberries. This hike restores our energy and lifts the spirits. On the way back we continue playing the theme game of this trip: looking for a piece of real estate we probably do not want to own. There are sites in this area with 360 degree views of the valleys below and mountains on the horizon. But why own them if we can visit every few years? Somehow, this run down dream farmhouse, bought for a song and renovated by local craftsmen, remains just an idea. Philip is not as sure of it as I am. But then, he does not own Wellfleet. Another café stop in a small town, and we end the day in a cheerful sea resort of Francovilla. The sea is tumultuous but not cold. We enjoy a seafood dinner in a somewhat pretentious restaurant on the beach, followed with a boardwalk stroll. Driving back through Chieti on the way home reveals a city more interesting than our earlier impression of it. We stop at Civitella, a modern stadium built into Roman amphitheater ruins. This is a teenage territory, surrealistic in its multilevel construction, colorful plastic ‘couches’ scattered around, striking lighting, and ‘nothing-to-do’ atmosphere. We clearly do not belong here. It takes a while to get home as we repeatedly get confused in the geography of Chieti. It is after midnight when we are back in the room. I fall asleep instantly. At breakfast we meet a couple from California. Our first Americans on this trip. Even I can see how different they are from the Europeans we meet. Much more outgoing, smiling widely, exuding energy and openness, ready to swap travel stories and personal information. Although the woman seems a bit of caricature of a communicator (she speaks like someone who teaches hearing impaired) I enjoy these people after the reserve I have encountered on our trips as well as in Holland (later I discover that she is an elementary school teacher, which explains here exaggerated manner in communication). So much easier to relax with them, even though this intense presence can be taken only in small doses. The mountain drive takes us up and up the hills. These are some of the most beautiful views of countryside I have ever seen. The houses are spatious and bespeak of prosperity. We wonder aloud about the benefits of agricultural subsidies for Italy, underwritten primarily by the Northern European economies. Perhaps without them this lifestyle, and this beauty, would give way to ugly development. As usual, we are hunting for the perfect piece of real estate. By now this is merely a spectator sport. At Farindola, a tiny town cut into a mountainside, we stop at alimentare – a convenience store – to buy sandwiches for the hike. The man cuts enormous slices of rustic bread. This is one of these perfect loaves with medium crust and soft chewy inside. I watch Philip watch the man build layers of ham, cheese, tomatoes and basil into enormous structures. He looks enraptured. At around 1500 meters the tree line is sharply demarcated. The landscape rapidly changes. Philip calls is Tibet. Semiarid hills on a large flat mountaintop. The aridness originates from the rocky surface, not from the lack of rain. In fact, it rains on and off, and it is cold at this elevation. When the weather stabilizes we park the car and hike for about two hours. Under our feet is gravel and limestone, and around us are these endless hills. This is a good hike. On the way down we drive through clouds and rain. We were, it turns out, very lucky with our hike under sunny skies. They were but a small oasis of good weather in time and location. It takes longer than we had expected to get down to Chieti, so we abandon the plan to shop in Pescara. Instead, we go home and enjoy two lazy hours before dinner. Our landlady Anna serves a magnificent five course dinner. I eat too much, including desert. Over dinner we meet two young Italian scientists. One is a geologist. He satisfies my curiosity about the nearby mountains. It turns out that what we took for Travertine marble in Ascola may be limestone. We then get into the question that puzzled Philip and me yesterday: why does the temperature drops with altitude. Each of us advances a favorite theory but neither seems to me entirely satisfactory. The truth is that we speak with authoritative air but we do not have our scientific facts in order. Our last full day in Italy. We share breakfast with the American couple. It takes a little over an hour to get to Lanciano where we meet Luca. He shows us the countryside along the steep coast of the Adriatic. In the early afternoon we arrive at his father’s country estate. Guliano is a robust man of 61 and health emanates from his eyes, complection, movements. Hundreds of olive trees and plentiful grapevines fill the estate. We pull huge ripe peaches, figs and plums directly from trees and admire the tomatoes. Guliano had been cooking a rabbit all morning in a heavy cast iron dish buried under hot white ashes in a brick oven under an olive tree. Luca’s sister and her boyfriend join us and we embark on a perfectly slow afternoon meal. It is surprisingly cool here under the grapes. Almost everything we eat comes from this estate, including the live oil and wine. The conversation winds its way through a lazy afternoon. We take short naps. At some point Maria and Alessandro return to their offices. We linger for a while longer. Guliano wants to give us crates of his wine and olive oil but we cannot take them. We settle for one bottle of wine each and olive oil for Philip. And a bag of peaches and plums. From Guliano’s estate we go to Luca’s family house in the coastal suburb of Lanciano to drop our things and change, and head for the rest of the afternoon on the beach. In the evening Luca shows us around Lanciano. This is a picture book medieval city spanning over four or five hills. The ancient walls are surprisingly intact, and so are numerous private residences within the city. This is really a beautiful city. We particularly admire the Roman bridge which links two hills. In the Roman era there was a temple next to the bottom of the bridge, which was later covered in order to create a flat city center at the level of the church. Right on top of the bridge a medieval church was built, then rebuilt again during the Renaissance. During the past year the buried underground temple was accidentally discovered during routine excavations, and subsequently unearthed. So, here they are: two realities on top of one another, separated perhaps by a thousand years. Luca shows us around these places. These days musical performances take place in the underground Roman temple. Tonight’s concert is romantic chamber repertoire. We have no time to attend. We continue sightseeing Lanciano for several hours. Luca keeps running into friends. This is his second day home after a seven month absence. He belongs here. We have a late dinner at a small cellar restaurant. The waitress keeps bring more dishes but I cannot eat anymore. I long for a plate of salad and boiled vegetables. Instead, I face different kinds of pasts, cheeses, meats. I do my best not to offend our host but I am dead tired. This has been a fine day. The drive to Rome is smooth and familiar. The delay at the airport, cause by a strike of traffic controllers, is not a problem. We hungrily devour newspaper we have not seen in almost two weeks. We are ready to go home.